Vision33 TOTAL Care is the name of our industry-leading support program offered exclusively to Vision33 customers. This support program is what enables us to bring the most value to our SAP Business One customers as it is our belief that service shouldn’t end with the SAP Business One implementation phase. Once your business is up and running, it’s only the beginning. Growing businesses need additional support to fully leverage their investment in enterprise resource planning (ERP) technology. In the Vision33 TOTAL Care Customer Resource SharePoint Site, you’ll find a variety of resources including product documents, previous Wednesday Web Chat videos, SAP Business One how-to guides, tips and tricks, and more. 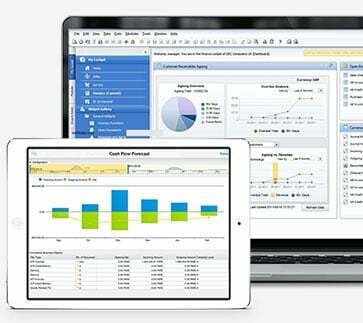 This is also the place for customers to access free SAP Crystal Reports templates from Vision33. By leveraging integrated reporting tools of SAP Business One, you can identify opportunities and access real-time data through various report formats and dashboards. Vision33 customers should already have the credentials necessary to access the Vision33 TOTAL Care Customer Resource SharePoint Site. If you can’t remember the username and password, you can check your inbox for the Vision33 TOTAL Care Wednesday Web Chat topic announcement email which will contain the credentials for your convenience. Once you’ve logged in, you’ll see on the left-hand side of the screen, ‘Libraries’ and ‘Documents’. Clicking on ‘Documents’ will reveal a folder titled ‘Crystal Everything.’ Here you’ll find a folder containing SAP Crystal Report samples – like free report templates that we provide to our customers. To download any one of these to your computer, simply right-click on the file name and click download and save the file. Once you have downloaded the report files, the next step is to upload them to SAP Business One. To access them from within the solution, go to ‘Modules’, ‘Administration Menu’, ‘Setup’, ‘General’, ‘Report’ and ‘Layout Manager’. To pull these reports into the system and into a folder, click the ‘Import’ button and the ‘Next’ button, then you can use the ‘Browse’ button to import the reports of your choosing. Choose the ‘Report Radio’ button and select the folder you’d like to add your report to in SAP Business One. Then click ‘Ok’. Next, you’ll receive a notification from the ‘Report and Layout Import Wizard’ that the import was a success. In the weeks to come we’ll highlight several of these Crystal reports such as Multi-Company Balance Sheet Report and Multi Company Profit & Loss (P&L) Statement. 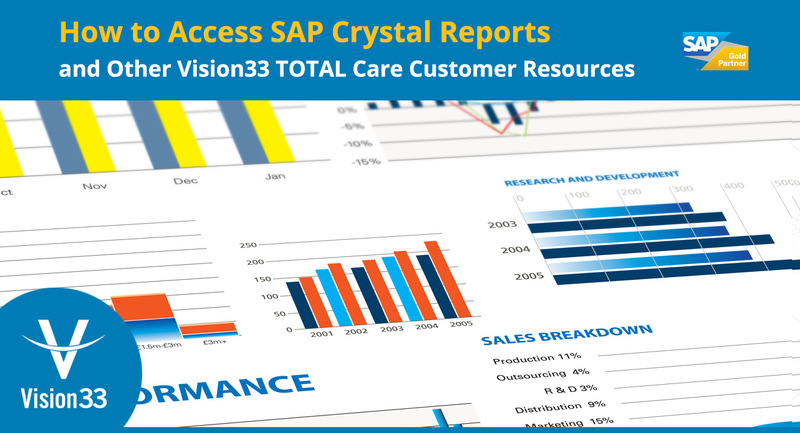 In the meantime, if you’d like a walkthrough of the types of resources available to Vision33 customers or an overview of some of the SAP Crystal reports, watch a video recording Vision33 TOTAL Care Wednesday Web Chat hosted by Carl Lewis.